PanaViz real estate photography would like to share some luxury Maui real estate that we have photographed here. Our 360 virtual tours, real estate photographs and home videos are displayed in our full screen viewer and are designed to work on desktops and mobile devices. 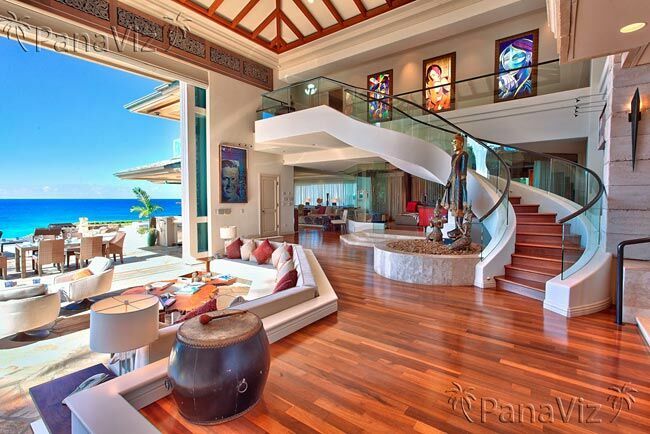 PanaViz photographed this luxury home in the Hualalai Resort on the Big Island of Hawaii. We produced a series of 360 degree full screen virtual tours as well as a collection of still images to visually present this property fully. We decided to shoot the virtual tours in the evening, primarily to showcase the exterior of the home, its glassy pool in the evening, and its proximity to the ocean. The 360 panoramas have a decidedly painterly feel to them. The architectural still photographs were shot in the day and at dusk. They showcase the many interesting spaces of this home, and the twilight images turned out very particularly well! PanaViz showcased this ultra luxurious 2 acre estate with a combination of rich media. We created 360 degree virtual tours, high dynamic range architectural still photographs and a narrated video to tell the visual story of this luxury property. This luxury estate overlooks the PGA Kapalua Plantation Golf Course, and looks over the Ritz Carlton Hotel and out to the Pacific Ocean. Our challenge was to capture this 6200 sq foot home in one day, with 3 different types of photography and in difficult lighting conditions. We opted to use panoramic photography to present the open layout of the property and to give a sense of the flow of the home. This was an exciting property to shoot. This luxury rental has lofty, open spaces and an eclectic decor. Our challenge was to showcase fully this 5 bedroom, 7 bath villa that rents for up to $60,000 a week. This home is truly unique, with sweeping views, gorgeous architecture, great decor and lovely artwork.